Pasta alla Marinara is an Italian dish from the Campania area around Naples Italy. All of the ingredients are available in this region. These people immigrated to the US in large numbers and gave us our current love of Italian pizza and tomato sauce. Yes food is a religion in Italy and the rules are endless. As the New York Times articles inform us, the meat is served after the pasta on a clean dish; the pasta is not left to drain in a colander, but is lifted out of the cooking pot and then added to the marinara sauce for final cooking; parmesan is not added to marinara. We did combine the pasta with most of the sauce in the skillet. 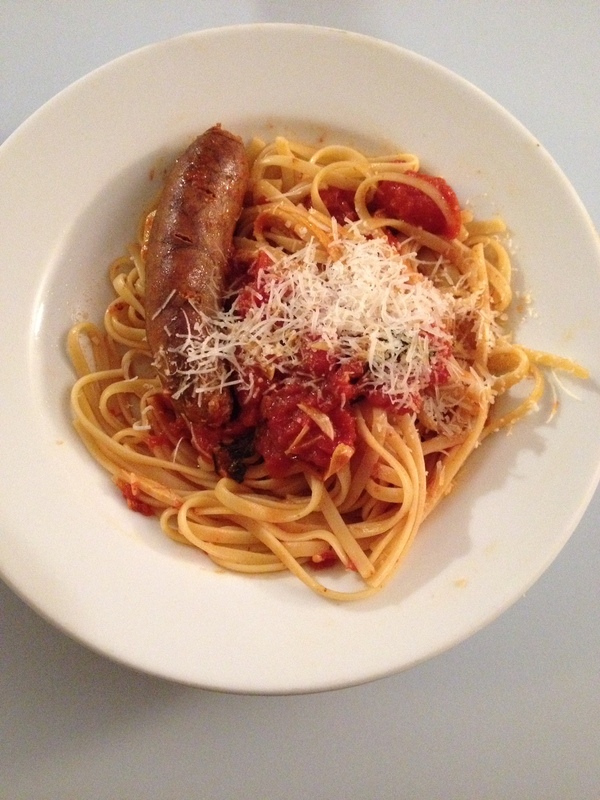 Otherwise, we followed the specifics of this recipe and Lidia Bastianich’s recommendations. Only peel and slice the garlic. Mincing the garlic breaks down the cells and releases the sulfurous molecules which give the strong flavor and odor. Look for Cento brand or other San Marzano certified D.O.P. whole plum tomatoes, though this special tomato authenticity is questionable. The San Marzano tomato is only grown near Mt. Vesuvius (think Pompeii) and is only a 60 square mile area. That’s a pretty small area for the millions of cans of “San Marzano certified” tomatoes sold every year. A domestic brand recommended is Redpack. Taste test several canned tomatoes to discover a favorite. Look for tomatoes that are fleshy and juicy, ripe from end to end, naturally ripened with few seeds and with a taste balance of acid and sweet. Whole tomatoes with added water/juice may be better than tomatoes canned with added sauce. The added sauce may make a Marinara too thick, but it is all about the taste! Again, I will only add water to the tomatoes, no stock or wine which “muddies” the taste. I will again only use a small dried whole red chile! Fresh basil only, though I do have the dried oregano on the branches purchased in Greek Town Chicago, which is an intriguing alternative. I will pay attention to look for the fresh basil with smaller leaves such as the small potted plants available. A new additional ingredient to this Marinara is seaweed and sea salt. Alla Marinara means “of the sailor”. The historical references are many, but one is the sailor’s trick for deepening the flavor: Their tomato sauce contained seaweed and sea salts which contain glutamates and produce umami, an element that adds a a rounded satisfying and savory flavor. Never serve Marinara on top of plain pasta. This is the most important rule! Add the al dente pasta to the sauce to heat through and complete the cooking. Serve the sauce coated pasta on the serving plate. No cheese with Marinara! Never serve cheese with fish or seafood either!!!! The meat will be served after the pasta, though for me, this is not a big deal to combine them at serving. I won’t cook the sausage in the sauce. Marinara can be cooked with fish and seafood, added at the last moments of cooking. The following is written by Julia Moskin, The New York Times. Adapted from Lidia’s Commonsense Italian Cooking by Lidia Bastianich. Click the link below for a cool video. Homemade marinara is almost as fast and tastes immeasurably better than even the best supermarket sauce — and it’s made with basic pantry ingredients. All the tricks to a bright red, lively-tasting sauce, made just as it is in the south of Italy (no butter, no onions) are in this recipe. Use a skillet instead of the usual saucepan: the water evaporates quickly, so the tomatoes are just cooked through as the sauce becomes thick. My husband Dave looks for recipes like the research scientist he is. This Marinara Sauce he found scrolling through the New York Times. Here are the two links which have all the info. Posted in main dishes and tagged Italian, Lidia, marinara, NY Times, tomato. Bookmark the permalink.